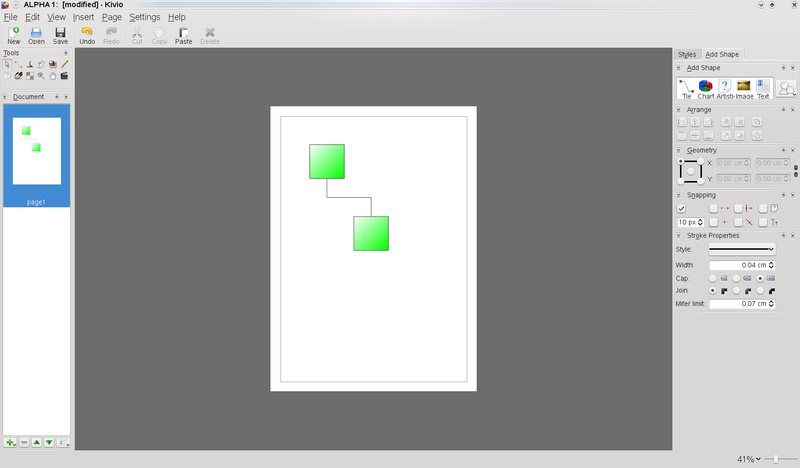 As you might know Kivio, the KOffice diagramming and flowcharting application, hasn’t been released with KOffice 2.0. Since the release a lot of people asked on IRC how long it will take until Kivio will be released and what’s still missing for the release. Of course the small code size doesn’t mean that it doesn’t have any features. Due to the high integration between the apps and the KOffice libs most of the features of KPresenter/Karbon are already available. For example load/save, inserting and arranging shapes, managing pages etc are done. Shapes can be rotated which was really missing in 1.6. Thanks to flake all shapes can now be interchanged seamlessy between Kivio and the other KOffice apps. At the moment there is also ongoing work to improve the connection tool. What’s missing in Kivio? Most of the work to make Kivio usefull has been done KOffice libs. What Kivio needs now are developers to fill the missing gaps. The most important missing features at the moment are stencils sets as we had them in 1.6 and support for text on shapes. Unfortunately we are all already busy with developing the other KOffice apps and day jobs, so nobody is working on this at the moment. You are currently browsing the Sven's Blog blog archives for July, 2009.